This is the description of the original cultivar, which is now difficult to find: Originated with the Rosthern Experimental Farm, Saskatchewan, Agriculture Canada, selected in 1936 and tested under this name but never officially released for commerce. The tree is vigorous, upright and spreading, and moderately productive. It is hardy to Zone 2a, and resistant to fire blight. The fruit is medium size 4.5 cm - 5.0 (1 3/4-2" ) in diameter, oblate, and matures in mid September. The skin is greenish-yellow with striped red or almost completely washed red. The flesh is white, fine textured, pleasant but somewhat astringent. It is good for fresh eating, good for cooking and stores well for 8 weeks. The tree is vigorous, round topped, with good wide-angled branching habit. It is very hardy, but susceptible to fire blight. This apple tastes better the longer it is left on the tree. 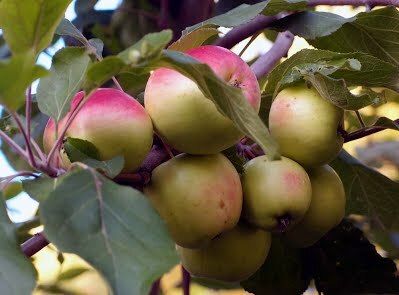 Due to its extreme hardiness/ good annual production and use in cooking/ juice, it may be a better overall variety than its reputation suggests. Note: This apple will taste bitter to some, as both the skin and flesh are green.